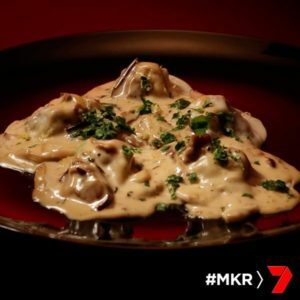 It is back to Number 32 on My Kitchen Rules Ultimate Instant Restaurant round tonight with Carmine and Lauren. Can they beat Tasia and Gracia’s high score of 85 to make it to the top? For entree the team are making vitello tinnato and duck breast with figs and vincotto. For main Carmine and Lauren are making beef cheek ravioli and lamb rack with crispy polenta and pea puree. Finally, for dessert Carmine and Lauren are making Tartufo and Citrus Sfogliatella. 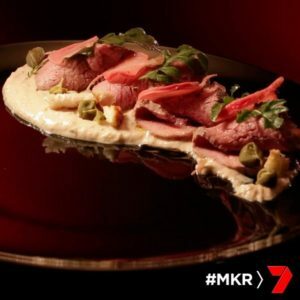 The team are quick at coles, they come back and quickly get their beef cheek into the pressure cooker and the duck breast into suvee bags and their pasta in the fridge. This gets them set up for each of their courses. The guests arrive and they’ve got their raviolli done and their sfogliatella rolled. The judges arrive and they take their suveed lamb and duck breast out and start cutting it, it looks perfect, they pan fry the duck breast to get a crispy skin. The guests aren’t sure what some of the dishes are. They bring the dishes out to the guests. Manu has the duck breast and Pete has the vitello tinnato. Manu says that he feels he skipped the entree and went straight to main course, the meal size is big. That was the negative, the positive was that it was a good dish. 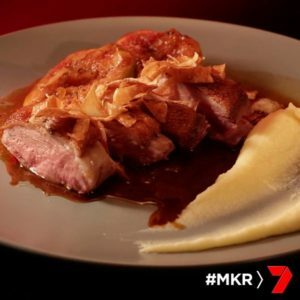 Manu loves the puree, it’s smooth and well seasoned and the duck is cooked well. Pete notices that Carmine and Lauren have modernised the vitello tinnato, he loves it. He said he can’t fault the dish. The veal was cooked perfectly and the combination of all the elements was perfect. Lauren get’s the pasta out, they’ve laid them on blue chux on top of trays. They’re sticking, when Carmine tries to separate them to get them into the pot, they tear. Lauren is able to save some of the ravioli by putting extra flour on them. They plate up their dishes and take them out to the judges. Lauren and Carmine take the mains out to the judges. Pete and Manu taste their mains. Pete has the lamb and Manu has the ravioli. Pete says the lamb was perfect and tender, it was like cutting through butter. He loved the polenta and the pea puree was his least favourite element of the dish. Manu says he loved the ravioli and the sauce but he wasn’t sure if they both matched together. The sauce was very strong in flavour and he could not taste the beef cheeks. The other guests taste their meals. Laura doesn’t like her ravioli and Zana said the combination of flavours didn’t work. She said the pasta was stodgy and thick. Lauren andCarmine get back into the kitchen to prepare their desserts. 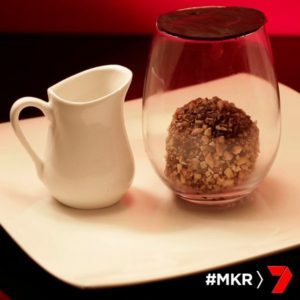 Lauren rolls the chocolate ice-cream into balls and then into crumbed hazelnuts. The decide to serve the tartufo in a glass topped with a disk of chocolate that will dissolve and melt when hot caramel sauce is poured on top. Next Lauren cuts and forms the pastry for the sfogliatelle and she fills them with the ricotta mix. They place them into the oven until they are golden brown. They dust them with icing sugar and plate them up. Lauren is having trouble with the chocolate disks for the tartufo, they won’t come out of the moulds and they keep braking. They have to make more tempered chocolate. She gets the chocolate on the pan to the right temperature, spreads it out again and puts it in the fridge, this time it worked. They accompanied it with hot caramel to melt the disc of chocolate on top. Pete poors his caramel on top of the chocolate. It melts through, he smiles. 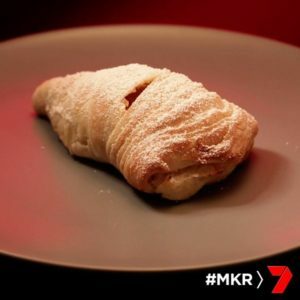 Manu tries his Sfogliatella, he said she should be proud of the pastry, it is perfect, golden and smells delicious, but the inside is not sweet enough for a dessert. Pete says his dessert is delicious, good quality chocolate and lifted up by the theatrics of the dish. Now it’s the judges turn. This puts Carmine and Lauren in second place. 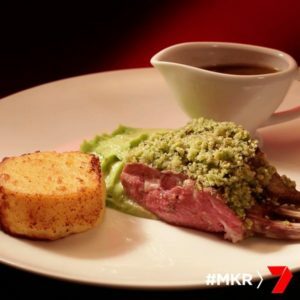 Why aren’t the last 2 rounds of the ultimate instant restaurant recipes not on the website? Carmine & Lauren and Anna & Jordan. Also not all the teams are featured under the recipes by team part of the website.